After a few e-mails back and forth, I met Jessica and Kris in a casual meeting in the lobby of La Concha Resort, right after they took a tour around their wedding venue. We talked about weddings, logistics, albums, etcetera. 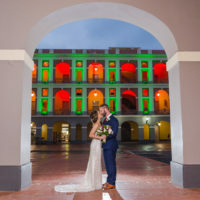 This is when I came to the realization they were having their wedding on La Noche de San Juan, or St. John's Eve, which is one of the most popular celebrations in Puerto Rico. Most hotels in Puerto Rico have a Noche de San Juan celebration, including La Concha. As many Hispanic countries, the island of Puerto Rico, once called San Juan Bautista celebrates St. John's Eve. The tradition on la Noche de San Juan is that you spend the night at the beach or pool party, and exactly at midnight, people fall on their backs into the water repeatedly as a good luck symbol. The amount of times varies depending on who you ask (in my family we say its three times). It is said that it cleanses your body from bad luck until next summer. A few months before the wedding, Jessica, which is an Olympic water polo champion, was in town helping the Puertorican Swimming Federation on water polo clinics. We took that visit as an opportunity to grab some coffee and go over all the questions, logistics and we were able to create a perfect wedding photography timeline that would allow us to finish every part downstairs before the festivities began. Having this amount of attention, not only helps me build trust and understand the client, but also give as much input as possible to make my job easier and perfect. After the groom's getting ready, we finally arrived at Jessica's suite where there were what it felt like a thousand women, all looking gorgeous! We started with the details while always-awesome Caridad finished the hair and make-up details for Jessica. I immediately fell in love with the color palette of the florals and the bridesmaid dresses. Tropical, intense colors were perfect for a summer beach wedding, and they would totally pop in the muted colors of the hotel. Although we had initially debated on the idea of having a first look session, eventually the couple decided they would rather see each other for the first time at the altar, so we walked downstairs to the Ocean Pool Terrace, where the Ceremony and Cocktail hour would be hosted. By now it was clear that Jessica and Kris were two cool individuals, but after watching their energy together at their beautiful, bespoke ceremony, it was pretty clear they're an epic couple. The celebration was equal parts happy, spontaneous and emotional. I spent more time than usual looking at the crowd, and everyone was grinning the whole time. After the rituals were finished, we quickly did the group portraits in the altar area, after which all guests and wedding party went to the cocktail hour which featured a Caribbean steel drum band. So tropical people couldn't resist swaying side-to-side with the music. Me neither. Jessica, Kris and me walked around the hotel for their newlywed portrait session. It felt very candid and spontaneous, and even when I did all the shots, it didn't feel like working for even a minute. We finished at the beach area, and right before sundown, we walked back into the cocktail hour so we could go a photo with all the guests together, from above. Their reception at Salon Indigo was pure energy. Once the music started, the dance floor was never empty again. Multiple dance-offs happened, each one more epic than the last one. We danced the night away, it was perfect. Hope you like this set as much as I did capturing it.